Katie Sluiter is currently an 8th English teacher in West Michigan. She has taught middle school, high school, and community college and has her Masters Degree and is currently working on her doctoral degree in Teaching English. Her writing has been featured on Writers Who Care, The Nerdy Book Club, and Dr. Bickmore's YA Wednesday. She is a member of the National Council for Teachers of English (NCTE), the Michigan Council of Teachers of English (MCTE) and ALAN (the Assembly on Literature of Adolescents of the NCTE). She is a National Writing Project participant, has presented at both state and national conferences, and has been published in the Language Arts Journal of Michigan multiple times. This week, October 7-13, is Mental Illness Awareness Week. October also happens to be National Bully Prevention Month with the 11th being National Depression Screening Day. 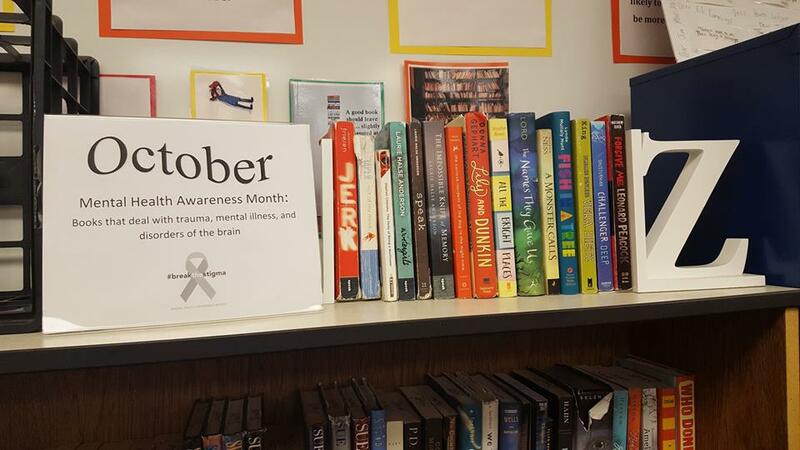 (World Suicide Prevention Day was September 10) To honor this, my Classroom Library display and all my book talks for the month focus on mental illness, wellness, ways the brain works, and the effects of trauma as told in young adult literature. Here are eight of the books I plan to book talk to my 8th-grade students this month. Caden is stuck between two worlds: one is a super smart high school student, the other is the resident artist for a ship that is headed to the deepest point on earth. Shusterman bases Caden’s descriptions of what it is like to vacillate between what the people in his life consider “reality” and his schizophrenic “reality” on his own son’s experience with schizophrenia, being hospitalized, and being treated with medication. I don’t know that I agree with critics who describe A Monster Calls as a fantasy novel. I think it falls more closely under magical realism. The book’s protagonist, Conor, has the same dream every night that he refuses to talk about with anyone. His mother has cancer and none of the treatments seem to be working. Conor is bullied at school. Conor’s dad lives in the United States with his new wife and family. Conor does not like to be left with his grandmother. One night, after his nightmare, something is different. Something is after Conor’s truth. I include this book with the rest of the mental health book talks because I think it does a beautiful job showing Conor’s grief and trauma in how he deals (or does not deal) with his mother’s illness. Lia suffers from anorexia and self-harms. After a fight with her best friend Cassie, Lia finds out Cassie has died from bulimia. She blames herself for not being there for her ex-friend and her mental illness spirals out of control. This book is probably better for more mature readers who can handle the content, but the content is important. It shines a bright light on eating disorders and the trauma that goes with them. I did not include this book on here because Lily was born Timothy and is a transgender girl trying to get through the 8th grade (that is the reason I share it again in May for my PRIDE display). Rather, this book is included because Lily befriends new kid, Norbert–who she nicknames Dunkin for his love of Dunkin Donuts. Dunkin has moved from New Jersey and suffers from bipolar disorder. Besides battling his mental illness, he is also hiding a secret. This book brilliantly shows what teenagers with mental disorders go through to “be normal” to everyone else. Perks has been on my book talk list for years and students still find relevant and important connections with it despite it being set in the 90’s, so it keeps a place in many of my monthly displays. While teen angst is not a mental illness, the trauma that comes with suppressing painful memories definitely fits with this month’s theme of mental health. Charlie, the main character, writes a series of letters to the reader about his freshman year of high school. It includes going from a “wallflower” to being more involved with friends, The Rocky Horror Picture Show, drugs, first dates, and all the other things that go into being a teenager. This one is definitely for the more mature reader and is here because of World Suicide Prevention Day. The book starts on Leonard’s birthday where he is taking inventory, giving away things, and making a plot to shoot his former best friend and himself. The book follows him as he says goodbye to people in his life, and as he does, his horrible reason for his suicide reveals itself. This book shows what trauma, neglect, and depression can do to a person. Autism is not a mental illness, but it does have to do with how the brain works. Christopher has autism and lives in England with his dad. As far as he knows, his mother is dead. When the neighbor’s dog turns up dead, Christopher decides he is going to get out of his safe routine to solve the murder. He uncovers much more than just the death of a dog. Haddon never labels Christopher as autistic or being on the spectrum. He wants to avoid that, but he does make a point of showing how some people have brains that process and work things–even family crises–differently than others. Another one that is not necessarily a mental illness, but a neurological disorder of the brain, Jerk, California is about Sam, a teenager who suffers from Tourette’s Syndrome. Sam lives with his mother and his abusive stepfather and is constantly having trouble in school due to Tourette’s. Angry with his life, Sam decides to go on a cross-country road trip to learn the truth about his family and his inherited disability. There are many more books in my display that students have access to, but these eight are where I start with book talks to give them a wide view of what the topic of Mental Health can deal with. It’s not just books about people with depression, but a wide range of mental illnesses, traumas, disabilities, and processes. Due to the uptick in mental illness among teens, books like these can be literal life-savers for some kids as they seek to create empathy and fight the stigma surrounding mental health care.